Family Dollar retailer is recalling 1.8 million toy dart guns sets sold across the U.S. from September 2005 to January 2009. The toys are an aspiration hazard, meaning they can prevent a child from breathing. A 10-year-old Milwaukee boy and a nine-year-old Chicago boy died after placing the dart in their mouths, and accidentally inhaling the soft, pliable tip which lodged in their throats and prevented them from breathing. 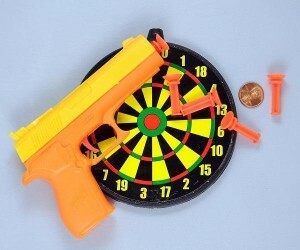 The “Auto Fire” toy dart guns cost approximately $1.50 and was sold exclusively at Family Dollar. It was sold with either an orange and yellow toy gun, or a blue and yellow toy gun, plus eight orange darts and a small target. The orange gun is item number P238 and the blue is item number 9328. The item number can be found on one side of the handle in raised lettering. The soft plastic darts are a little longer than one inch in length and have a small suction cup at one end, which is about one-half of an inch in diameter. The small target is green, red, yellow and black, and measures five inches in diameter. “Gordy Toy” for “Ages 8+” is printed on the packaging. Family Dollar is cooperating with the Consumer Product Safety Commission on the recall. The guns were manufactured by Henry Gordy International Inc. of Plainfield, New Jersey, but that company refused to recall dangerous the toy dart guns. They were manufactured in China. If you have this toy set, you should immediately take it away from children and discard them. You can also return them to Family Dollar stores for a full refund. For more information, call Family Dollar at (800) 547-0359 between 8 a.m. and 5 p.m. ET Monday through Friday. If you or your family have suffered due to a defective or recalled product, contact the defective product attorneys at Carr & Carr in Oklahoma. Carr & Carrs lawyers are experienced in helping people work with recalled products that have caused injury or death. The Tulsa office phone number is 918-747-1000 and the Oklahoma City office phone number is 405-691-1600. Ask to speak to a lawyer who can start working for you. There is no charge for your initial consultation. Should I See A Doctor After A Car Wreck?